Pentaptych - three vertical oban prints on the top over two horizontal obans on the bottom. This is a highly unusual and rare composition. Here is a partial list of some of the actors portrayed here and there roles if know. 25. Iwai Shijaku II (岩井紫若) as Agemaki (あげまき) - Agemaki is the name of a courtesan named after the 47th chapter of The Tale of Genji. 'Agemaki' means 'the trefoil knot'. The figure in the blue robe in the upper left, with the bat tattoo on his face, is Kōmoriyasu or 'Yasu the Bat'. In the lower part of the top right panel is a woman who has a sandal in her upraised right hand. She is about to strike the woman cowering below her. 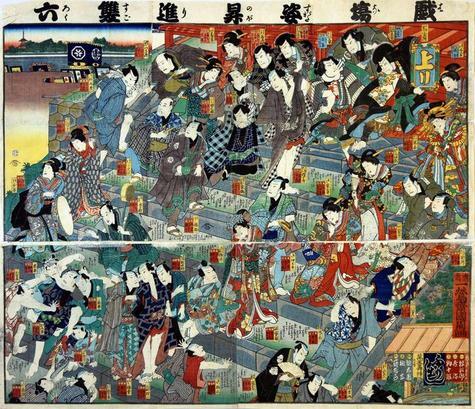 These women represent Iwafuji with the sandal and Onoe. Marks does not list Kunichika as one of the artists published by this house. In fact, he says: "Presumably a collector's seal as it was later applied on prints from c. 1780s-1860s and is found together with other publisher seals as well as on prints that are usually without publisher seals (e.g. surimono)." We have no way of disputing this idea, but do wonder if it is correct. The Tokyo Metropolitan Library lists this publisher as Manzen (i.e., Yorozuya Zentarō).